First of all, HAPPY 2015! Hehe, telat sih, tapi gapapa lah, ya. If you confuse why the title is Page 27 of 365, I give you some brief explanations. It is because today is 27th Jan, 14, and if I am not mistaken, 2015 is consisting of 365 days, so the post title is 'Page 27 of 365'. I have to tell you that 2014 is not really a good year for me at all, many things happened unexpectedly and all I can do is staying still. But, it doesn't mean that my 2014 is always being about bad things and bad luck.God gave me and my friends an opportunity to publish our own original magazine. And, we will keep on publishing walaupun sering kali telat dari deadline sampai beberapa bulan. But, I promise, we promise, that we will keep doing it. If 2014 mostly about something bad, I have to say that 2015 is starting with also bad things, but it smoothly rotates and changing into something pretty interesting, hopefully. Also, in the very beginning of this year, I have made two important decisions for my life, I will tell you later about this anyway. 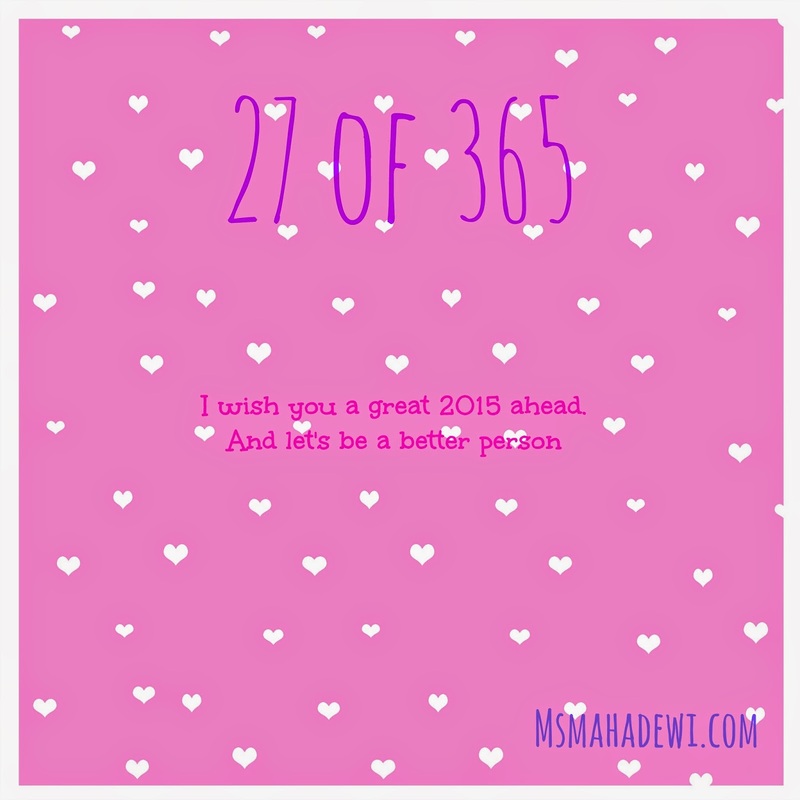 But meanwhile, please, please, wish me the best luck for 2015. Really. I need it to be a better person with this. I have my own resolution, since it is extremely private, I don't share it here. But you can ask me privately HAHAHA. You, yes you who read it, I wish you a great 2015 ahead. And let's be a better person. thanks for your visit, temennya Uni dan Arif ya?